Hi Friends, yesterday I showed you the stack o’ pancakes I had enjoyed with my little family last weekend. 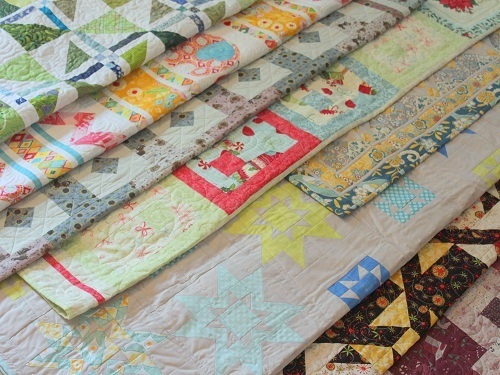 Here you see my latest stack o’ “returned” quilts! Except for the one that is on the far left, I had received the rest back from various magazine editors within the last 10 days. I look forward to showing these quilts to you after my sewing frenzy is over. 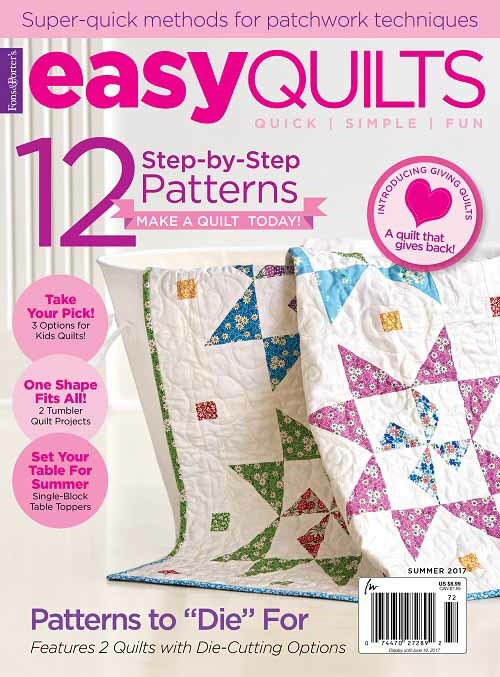 Also, many of you who have quilted much longer than I have, just what do you do with your stacks o’ quilts? 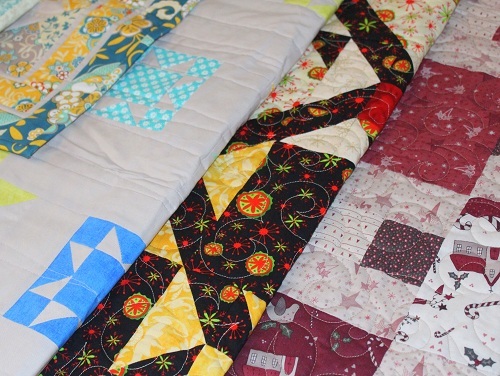 How do you store your quilts? Thanks for stopping by. I am STILL sewing like mad — and today was pretty much a write-off because I mostly un-stitched! GRRR — I didn’t need that extra work of taking out stitches, and re-stitching pieces this late in the game before Market. Yet, it is what it is… Hugs to you all! Well, I have to confess I spread my finished or almost finished (binding needed) out on the spare queen bed. Please don’t ask how many. I am slowly giving some of them to special friends. Would rather sell, but have no outlet for selling. that’s how I store mine. I did talk to a quilt appraiser and if you want to store in a plastic tote, wrap in pillowcase or sheet first, then drill 2 holes just below the lid on 2 opposite sides so it can breathe. Then cut an odor eater in half and tape on the bottom side of the lid to absorb any musty odors or humidity. I want to see Midnight Flurry. I like that punch of yellow and red in the black. Second choice is Nature Walk. I like to see Midnight Flurry and Nature Walk. Really hard to decide. I usually give things away or store in a cedar chest that I have. They all look gorgeous. Don’t mind what order they’re shown!! My stack of quilts is mostly gone! The vast majority of my quilts have been gifts or donations, so I don’t have many in the house. Still here are three on walls, a few place mats and table runners, and a few larger ones. So I don’t have problems with storage. Two large ones are hanging over my stair rail now. As the weather gets colder, they’ll come off and surround us with cozy warmth. Wow. I can’t believe so many quilts have arrived in the last ten days. Makes me equate that to how you could possibly have created them all, in a similar window. 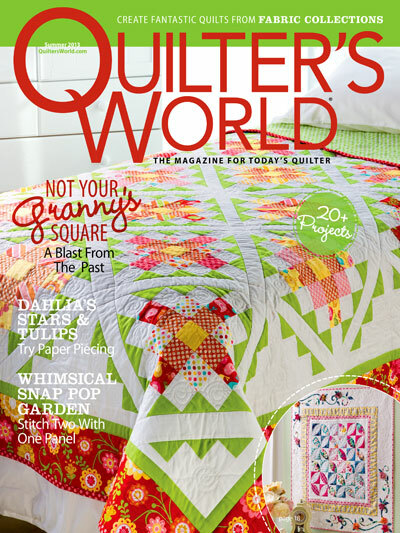 You are an amazing whirlwind quilter. And, I look forward to seeing all of them, in any order. But only when you have time to share. For storing quilts, I’m not a good roll model. I don’t have a lot of room and tend to fold them. Some are in closets, some are in cabinets, some are on the backs of sofas….but most have been given away. Of those in the business, some I know fold and store, some roll and some layer quilts on top of a guest bed. But I do recommend if you are a folder, to not re-fold on the same fold every time you fold. I wonder why I don’t see more quilters “hanging” for storage, but maybe it is because our domestic options are for hanging single quilts at best. Wouldn’t it be nice to have a “mansion” and be able to float quilts from the ceiling, row after row. We’d never need to fret about fold lines. Oooh I can’t wait to see individual photo’s! :-) I have many displayed around the house, and those that are out of season are in a cabinet…. I guess I’m not much help. Sorry you had to play with your ripper! Hope you have a better day tomorrow! Golly, somehow my automatic contact info has gone missing……I just sent the previous comment …….and now this one……..hmmmmm…….computers!! I am very excited to see all your work when you have a breather. I feel very fortunate to have someone so talented So freely sharing. 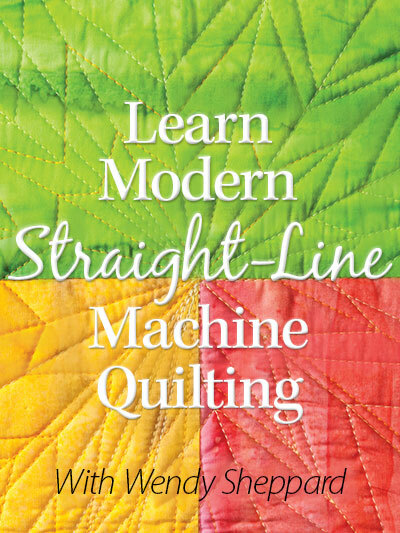 Your patterns are a terrific engineering feat and the quilting exquisite! Thanks a bunch. I don’t have room to keep many quilts so they’re given away as gifts or to charity. Your work is very inspiring! One day I hope to have enough quilts to worry about storage issues. So far most of mine are gifted! Oh, Midnight Flurry is calling out to me!! Most of my quilts are gifts, but I do have some of my keepers displayed on quilt racks of various types. Unfortunately I have more in my “to be quilted” stack than should be allowed! Well, Wendy, since you asked, I’d love to see Persian Rug or Starry Dance first. I’m in awe of how prolific and precise you are. Most of my quilts are given as gifts or donated to charities. There are some hung on display in my home. The few kept favorites are folded in a closet, and I take them out and look at them once in a while. I am glad to know I am not the only one who has to take out stitches. I am getting nervous, I started sewing Christmas gifts at the first of September, and I don’t seem to be making much progress. Midnight Flurry , as I am attracted to those wonderful colours! 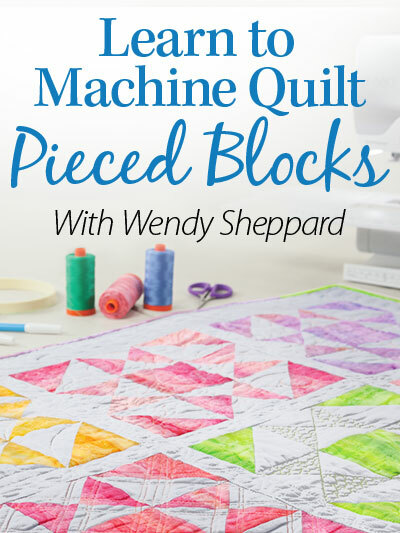 What on earth do you do with all your quilts once you have made them? Do you sell them? I should imagine you would soon run out of family to “gift” them ally on my 9th quilt (5 of them were baby quilts for friends and family) and my husband is looking worried already!!! we don’t have that many spare beds! 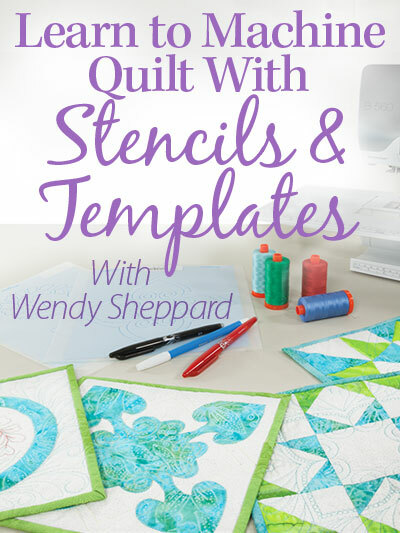 I don’t ‘keep’ anything I make….I quilt for a specific purpose,….I do have a box full of unfinished tops from last winter…when I was taking a class and making a different quilt top each week. I’m looking forward to my week of classes at IQF in Houston! Maybe I will see you there! 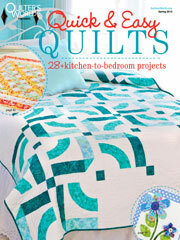 That’s a lot of quilts! I give most of mine away. I think quilts get sad when they are not being loved (used). Elephant Walk and Winter Wonderland intrigue me BUT whatever order is fine. Majority Rules??? Thanks for sharing – great inspiration. I would like to see #7, Midnight Flurry, first! I like the dark colours best! 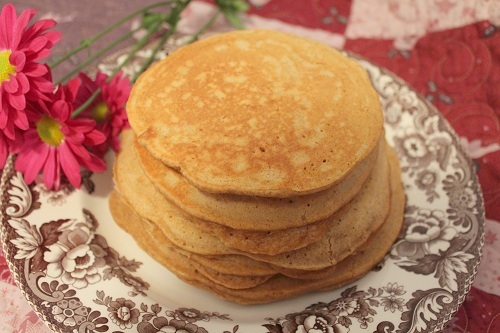 Also re: pancakes: I always grated some apple into my pancake batter, and added cinnamon and ginger! Always great in the fall and winter. Those are lovely quilts. I would love to see the starry dance first. The color really appeals to me. 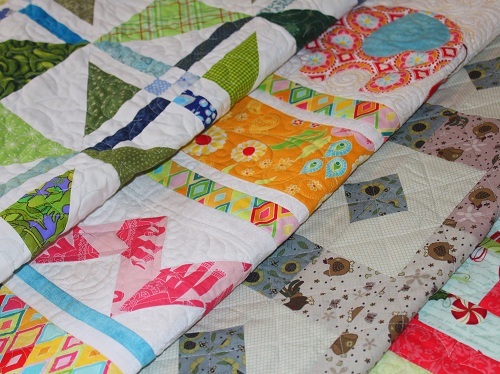 What a wonderful stack of quilts! I don’t often have a backlog that need storing since my quilts usually have a recipient waiting. If I’m “playing” with a pattern and don’t have a name attached, I fold them inside out and hang them in the closet till they have a home. Most are gifts, but some are donated…two went to Colorado Springs this summer for families displaced by the fires. First, I want to see the elephant quilt VERY BADLY and I hope you will show that one first. Next, I finished my first quilt in 2002 and I have only made a total of nine. I take a bit longer than you do to finish each one… ;-) Out of those nine quilts, four were given away as gifts, two are currently on my sons’ beds, and one is folded up in my son’s closet (a “crib sized” quilt that comes out for picnics or an extra layer on the bed when it’s chilly). Then there’s the fall themed couch snuggling quilt, which is going on the couch today, and the other one, the first Roman Square that was made for my 12-year-old when he was two — that one is folded on a chair in my bedroom awaiting repairs, because he used to chew on the edges of the quilt when it was on his bed for nine years. So, I don’t really have that quilt stack storage issue! You’re so prolific! Thus far I’ve saved most of my larger quilts. I moved to Florida with 116 of them. The larger ones are stored two to three to a pillow case and are stacked on the top shelf of the master bedroom closet. Smaller quilts are rolled and stored in a drawer in the footboard of the master bedroom king-sized bed. And another dozen-and-more are hanging on walls. My only advice is to never store a quilt in plastic. it’s the worst thing you can do for it.